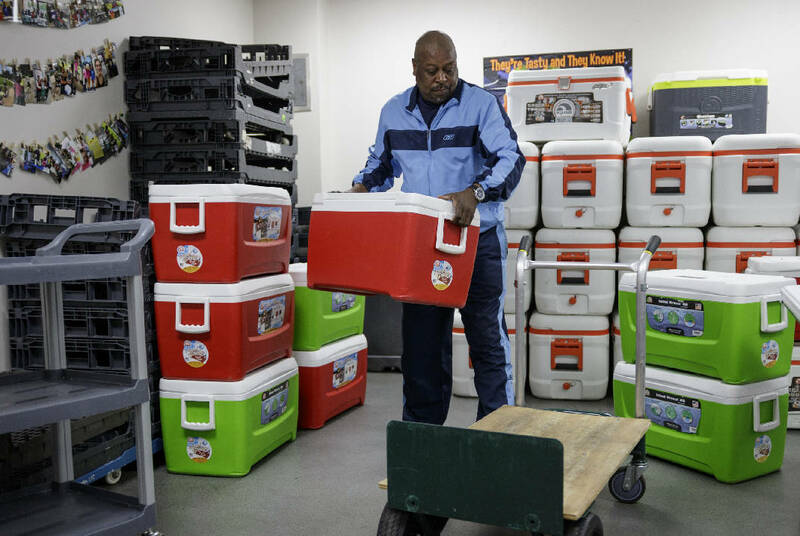 Darrell Dallas, lead driver for the Youth and Family Development center's food program, loads coolers of meals at the James A. Henry YMCA's meal center on Dodson Avenue for delivery to YFD recreation centers on Tuesday, Dec. 19, 2017, in Chattanooga, Tenn. The YMCA prepares meals for community centers across the city to help feed area kids and fight hunger. During the holidays, typically times associated with abundance, many find themselves reflecting on the gifts and blessings they have — but many also do without. Those who do without are often students. Before those students can worry about TNReady scores or grades, many in Tennessee face challenges getting into classrooms ready to learn. According to a Scholastic report released in December, the second biggest barrier to learning that Tennessee children face is hunger. Eighty-nine percent of teachers in Tennessee report having students in their classrooms who are coming to school hungry. Nationally, 75 percent of teachers report the same. Hunger is sometimes the most tangible issue of equity, which includes living in poverty or homelessness, family crises, lack of language skills, need for health care, mental health services or undiagnosed learning disabilities. When a student is hungry, he or she often does not have the energy or focus to be successful in the classroom. POLL: Do you know any Tennessee students affected by hunger? Source: Chattanooga Food Bank’s 20-county service region via Feeding America’s Map the Meal Gap. "You never know it is an issue until you see it face to face," said Meredith Snyder, program director of the nutrition department at the James A. Henry YMCA in Chattanooga. One of the ways the Hamilton County Schools district fights hunger is by providing free or reduced-price lunch and breakfast to eligible students. Click here to read the full Tennessee Teacher & Principal School Report from Scholastic. Thirty-eight of the district's schools serve lunch and breakfast daily to all students through the Community Eligibility Provision under the National School Lunch Program, a federal meal plan that allows a school to provide free meals for all of its students if at least 40 percent of the school's population meets the criteria for free or reduced-price lunch. However, the time between lunch and breakfast can be long, and some children may not be eating enough after school and in those hours in between. This year, as community organizations cut programs and funding such as the loss of the Chattanooga Food Bank's Sack Pack program in eight counties, making extra meals and snacks available to students is even more important. Snyder heads the YMCA's program that provides free or low-cost meals to after-school programs and community organizations such as the city's Youth and Family Development centers. "Nationally, one in four kids might not know where their next meal is coming from. In Tennessee, it's one in three," Snyder said. In 2017, the YMCA served more than half a million meals to 24,000 children at 106 sites in Hamilton and Bradley counties. Chattanooga Girls Leadership Academy is one of those schools where students receive free breakfast and lunch, and snacks are provided to students who stay after school for tutoring and extracurricular activities. "We know that children are hungry because they will tell you they're hungry," said CGLA Executive Director Elaine Swafford. "I really believe that some stay [for tutoring] because there's a healthy snack at 4:30 or 5 o'clock. Not all kids are getting enough to eat so it's an opportunity to have another snack before they go home." The meals the YMCA provides are also prepared by hand by YMCA volunteers — the only such model in the state — and aimed at being nutritious. "We have to have a certain amount of vegetables — either a half cup of vegetables or a half cup of milk, whole grains or a protein or protein alternative, and every meal has to have a milk," Snyder said. The YMCA also serves as a vendor to community organizations in the region who purchase those same meals through their own meal-funding programs. "The good thing about the Y is that they are really good about fixing healthy meals for us. They are healthy snacks — it could be a sandwich, it could be a chicken or vegetable wrap," Swafford said. "At some schools, some lunch programs are a revenue stream, but it's not for us." Snacks also come in the form of take-home packages, sent home with students, such as the Food Bank's Sack Packs. CGLA is one of Hamilton County's schools that receive sack packs. The bag of food, which normally includes nonperishable, shelf-stable items, is distributed to students who have been identified as potentially missing meals over the weekend. This year, the food bank and 31 partners actively served 12,000 children per week across its 20-county service area, said Laura Kilpatrick, the food bank's director of agency and government relations. In December, the food bank announced it would be cutting the program in eight counties because of insufficient funding. According to the district, 2,000 Hamilton County students received sack packs from the food bank last year. CGLA's sack packs arrive in partnership with the East Brainerd Church of Christ. Swafford does not know if the school's students will lose their sack packs. The Y had not been contacted before the end of the year by organizations in an effort to get meals to sites where the food bank's programs had been cut, Snyder said. However, the Y hopes to launch a similar program this year called Backpack Blessings, which it already implements in North Georgia. The Y's backpacks include shelf-stable food items as well as toiletry and hygiene items for children to take home. East Brainerd Elementary and East Lake Elementary both also receive a version of snack packs from local churches including East Brainerd Church of Christ, St. Martin of Tours Episcopal, Brainerd Presbyterian and New Hope Presbyterian. Opportunity Zone schools, which all contain populations of concentrated poverty, are particularly invested in the issue of student hunger. East Lake is among the schools that have a food pantry. The food bank also funds mobile pantries that visit particular schools and communities weekly or monthly, such as CGLA. Overall, hungry students are not limited to Chattanooga and the surrounding counties. The Scholastic report shared "that a majority of teachers and principals in the state agree that many of their students face barriers to learning from outside of the school environment." The report also cites a study out of the University of South Carolina by economist Orgul Ozturk and her colleagues Chad Cotti and John Gordanier on the disadvantages faced by children suffering from malnutrition. Ozturk's report found that "children who come from families that are several weeks removed from receiving their food-stamp benefits perform worse on an important math exam." Overall, Scholastic's report found that Tennessee students face barriers to learning more often than many of their national peers. Tennessee teachers are more likely to have students who are living in poverty (93 percent compared to 82 percent nationally), as well as students who are homeless or in temporary housing (75 percent vs. 66 percent nationally).